On 27th of September, 2012 the Serbian Delegation of Jat Airways a.d. Joint-Stock Airline Company has visited the Embassy the Republic of Serbia in Baku. 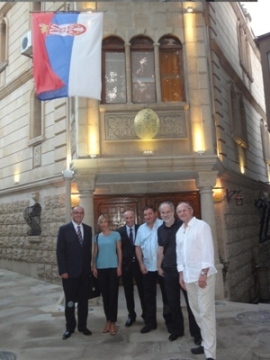 The Ambassador Extraordinary and Plenipotentiary of the Republic of Serbia to the Republic of Azerbaijan Zoran Vajović welcomed the Serbian delegation in historical heritage UNESCO the Old Town – Icheri Sheher, where the Embassy building is located. The Serbian delegation during the visit to Baku had meetings with the Azerbaijani counterparts and discussed perspectives of development in the relations between Serbia and Azerbaijan.